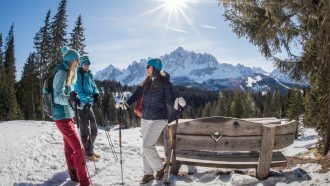 There is truly nothing quite like the Dolomites in winter and we offer you a week-long adventure, exploring the highlights of the region at your own pace. 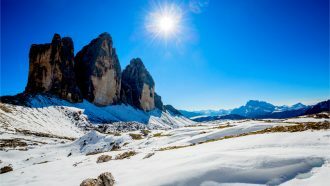 During this winter walking holiday in the Dolomites, you will walk in the snow-covered mountains of the Dolomites of Sesto and the iconic UNESCO-listed Three Peaks, the pearls of the Dolomites. 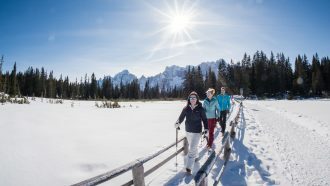 The Dolomites winter walking trip is going to take you through the valleys of Sesto and Braies, known for their amazing wild nature and located at more than 2,000 metres above sea level. The tour goes through well-established ans safe routes and is suitable for both less experienced walkers and fit hikers. You arrive at the hotel in Dobbiaco/Villabassa on your own. Free, unguarded public car park near the hotel. 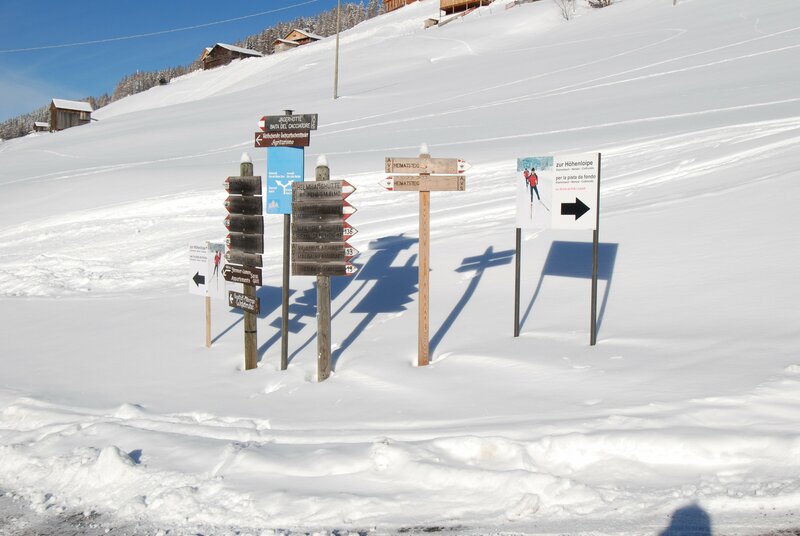 In the morning a transfer takes you to the Innerfeldtal in Sesto. 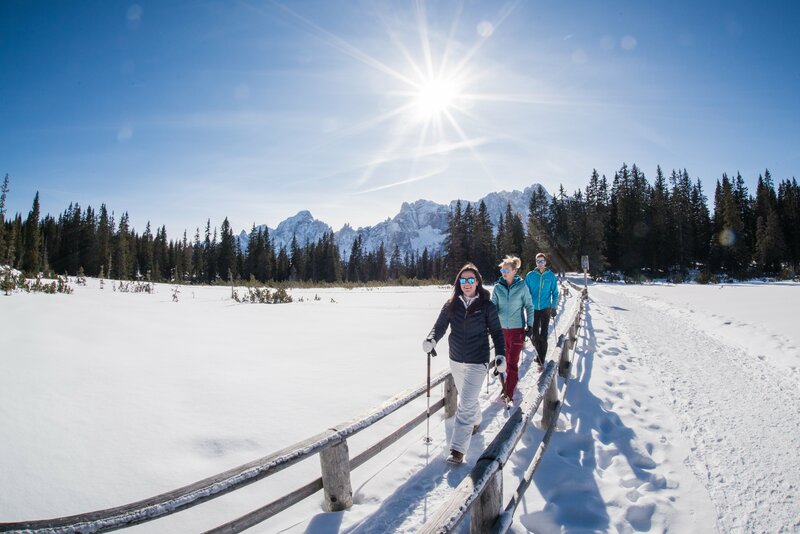 In the beginning you will walk through snow-covered larch meadows until you get to the Drei Schuster hut at the feet of the mighty Dolomites peaks where you can taste the local specialty – warm “Apfelküchlein” and enjoy the view of the Dreischusterspitze, as well as the Schwabenalpenkopf before getting to Sexten. 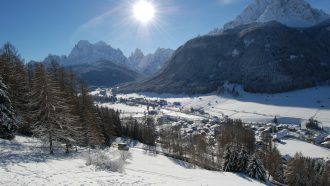 Today you enter into the Dolomites of Sesto: the Zwölferkofel in front of you and the Dreischuster peak on your right. From Passo Monte Croce you walk to the Alpine pasture Klammbachalm (hut) onto the Nemesalm (mountain pasture). After a short break you walk back to the Passo Monte Croce and your hotel in Sesto. 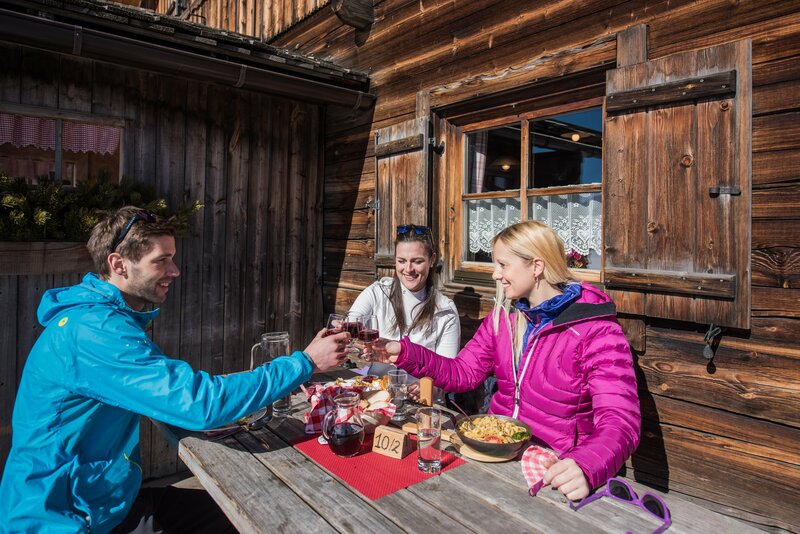 You start your winter hike today at Gasthof Brückele. The trail leads you along the Stolla stream through a quiet valley to the hut of the same name. The mighty Hohe Gaisl towers above you. Soon the valley opens up and you reach the plateau of the Plätzwiese. Starting from the Plätzwiese, you hike to the Strudelkopf. 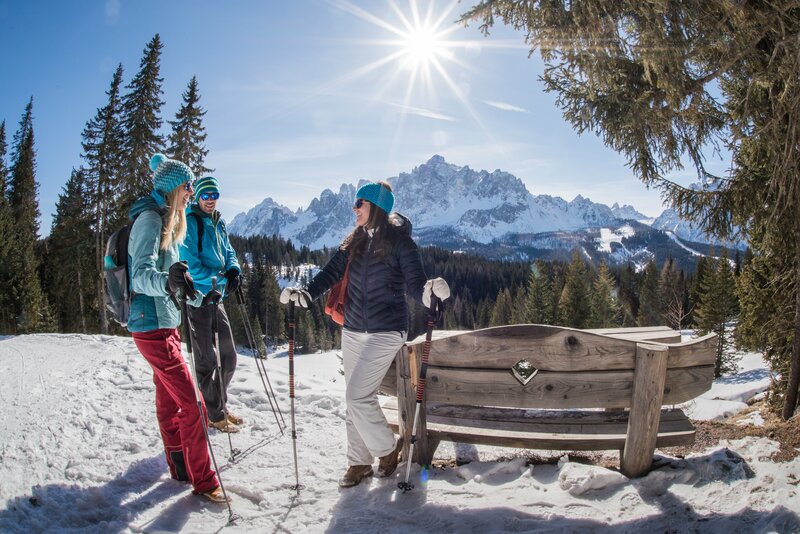 The ascent itself is marked by a breath-taking panorama of the great peaks of the Pragser Dolomites, such as the Hohe Gaisl or the Seekofel. 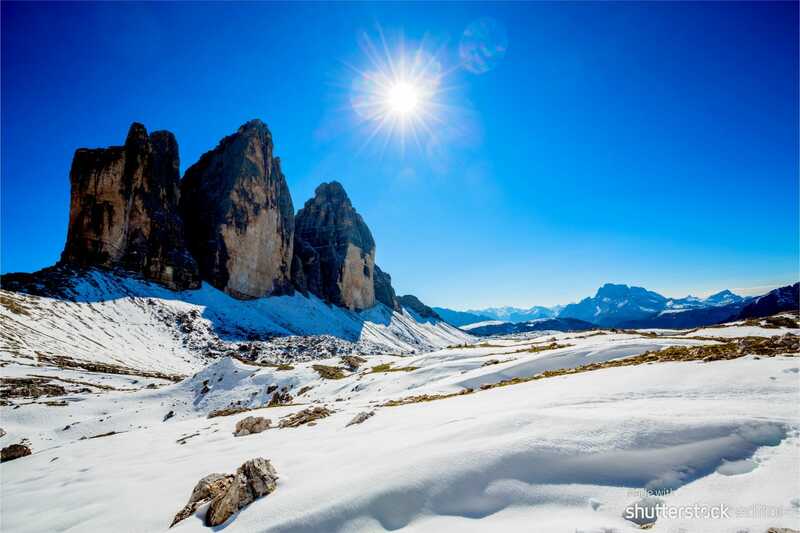 The Strudelkopf offers one of the most beautiful panoramic views in the Dolomites to the peaks of the Drei Zinnen, the Cadini group, Monte Cristallo, the Tofana and the Marmolada. 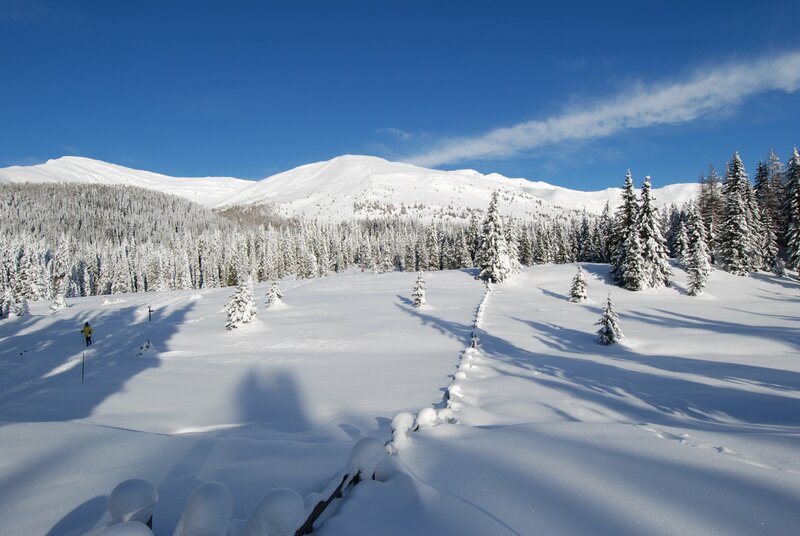 Escape mass tourism and experience the silence and tranquillity of the winter landscape! 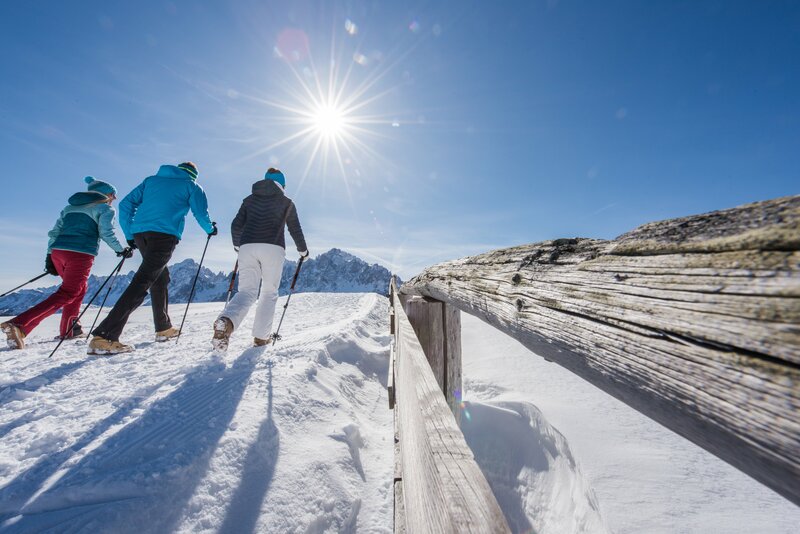 The amazing Alps panorama and deep snow-covered woods will award the consistently ascending path to the hut. 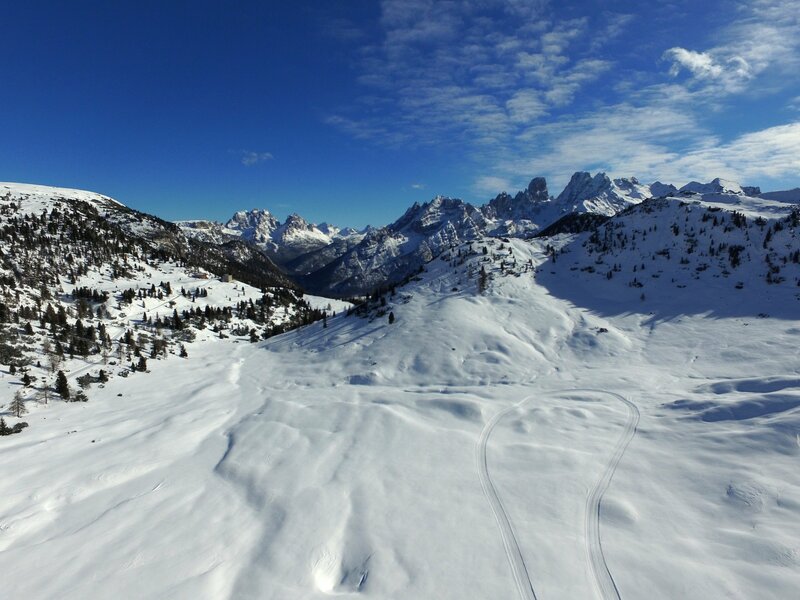 A transfer will take you to Misurina in the morning. Surrounded by mountains you start the hike. Soon you will reach Lake Antorno. 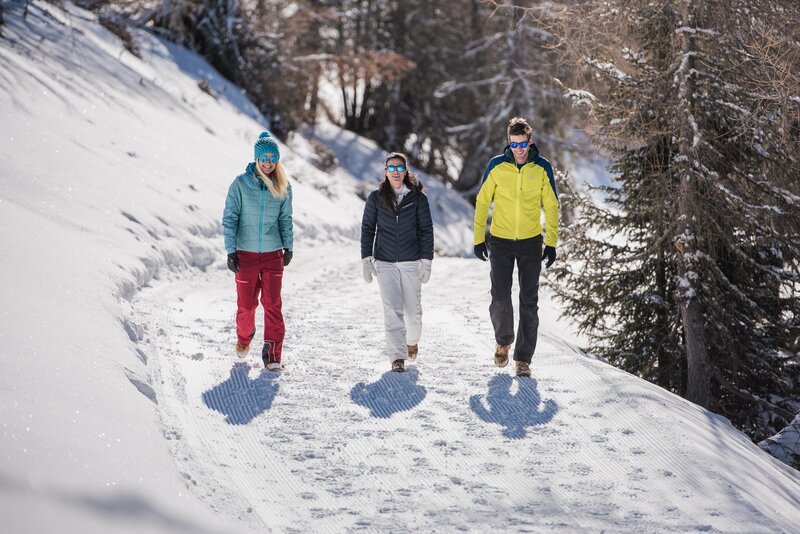 The path leads you along the snow-covered mountain road to the Auronzo hut, on the south-western side of the world-famous Drei Zinnen (Three Peaks). 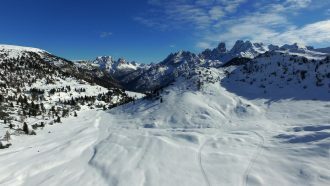 From the terrace enjoy the stunning panorama of the Dolomites! 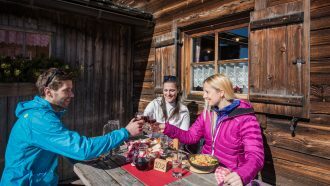 Five nights in 3-star and 4-star category (mostly with sauna and/or indoor pool) and two nights in mountain huts: Bonner Hut and Auronzo hut. All accommodations have en suite private double/twin rooms. We have carefully hand-picked all places and regularly monitor their quality. We have tried to choose accommodations that offer friendly service, clean and comfortable rooms and local flavour. Breakfast and dinner served at the accommodation. Picnic lunches can be bought in each hotel. 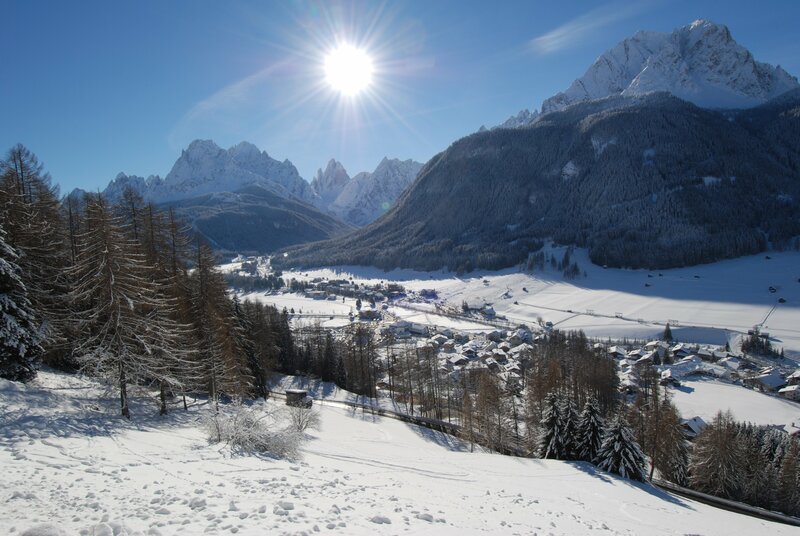 Drive along the Felbertauernstraße to Lienz in Eastern Tyrol (Austria) and then further into Italy through the valley Pustertal/Valle Pusteria to Toblach/Dobbiaco or Niederdorf/Villabassa, depending on the location of your hotel. Take the train from Innsbruck over the Brenner/Brennero to Franzensfeste/Fortezza. 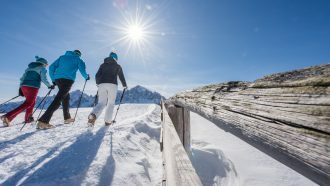 Change trains for the Pustertal/Valle Pusteria – Lienz and get off either at Niederdorf/Villabassa or Toblach/Dobbiaco depending on the location of your hotel. Low cost flights are available to Innsbruck airport, Sant’ Angelo – Antonio Canova airport in Treviso and/or to the Marco Polo airport in Venice. Note that flight information can change rapidly, and not all flights run daily. Please do check directly with the airlines’ websites or Skyscanner before finalising any booking with us. Please do not book your flights before we have confirmed your booking. Baggage transfer on walking days is included and your bags will be transferred by your current hotel (or by private transfer) to your next hotel. During the briefing before the tour you will be provided with detailed information, route description and detailed documents (route maps, sightseeing, important telephone numbers). We strongly advise you to follow only marked trails and never try to shorten the path through the unknown and unmarked terrain. We will provide you with detailed road notes and maps, and you can call our local 24/7 local assistance phone number anytime. The tour can start every Wednesday, Saturday and Sunday from 6 January (first possible arrival day) until 3 March (last possible arrival day). We recommend that you travel as light as possible – airlines might charge you an extra fee, and during ground transfers, place might be limited. Ideally, you should bring one piece of luggage weighing not more than 25 kg (to be checked in) and a daily pack (15 – 20 l rucksack) for your everyday essentials (snacks, drinking water, camera, etc). Below is our recommendation list of what you should bring. 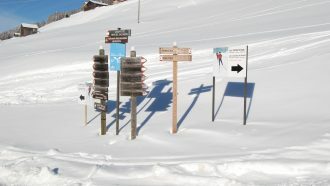 In case the conditions require snowshoes and poles you can rent them at the spot. If you need further advice, please contact a reputable outdoor retailer or us. A mobile phone – useful in case of unexpected problems and the network is fairly reliable in the borth of the massif. A 20 – 40L backpack with a belly-band to carry your personal belongings during the day. Another bag that will be carried: a backpack or travel bag (not too big nor not too heavy) 10kg maximum! 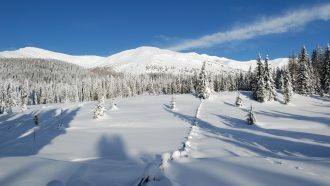 Hiking clothes, loose-fitting, comfortable and warm, comfortable trousers (Gore-Tex), please avoid jeans! A pair of mittens and a pair of gloves. Alpine skiing mask (recommended in case of bad weather). 1,5L flask (optional). Beware of the dehydration on the snow. Camera + cover (for the cold). Do not forget to bring some batteries. Where solo travellers or individual members of a group require a single room, a single room supplement is applicable as costs are not shared. This trip is NOT available for solo travellers.